Today's post is a continuation of my previous one, from my "Back to School" mini series. This post is going to tackle one of the many "issues" I face when getting ready in the morning...what's my scent going to be? Now, generally, I'll have my "trademark" scent, but when I like to change things up a bit, I like to have a little mini collection from my perfumes that I can decide from. Because the less options in the morning for me to decide from, the easy it will be for me. So today, I'm showing the perfumes that are amongst some of my favourites of the moment. Starting off with a surprising favourite, the "DKNY Be Delicious". When I received this as a Christmas present one year, I'm not going to lie to you, I wasn't as excited to be using it compared to it's partner (down below). But from first spritz, I fell in love. 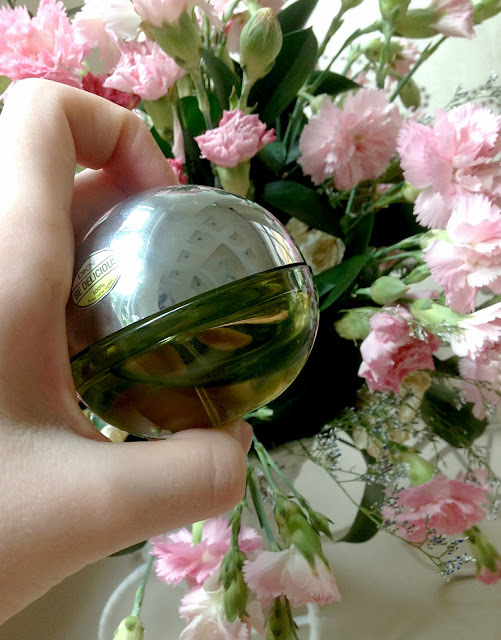 Apple scents have never been amongst my favourites up until recently, and I find myself reaching for this perfume on mornings when I'm not wearing my favourite perfume. It's a lovely, fresh and fruity scent that smells - ironically - like apples. I know, I know, surprising. It's got a little sour edge to it, but the tartiness isn't cringeworthy, and thats one of the reasons I love it. This is the sister to DKNY's apple perfume. The two came in a joined pack, and because of this, I paired them together when I began using them. They create a lovely marriage of scents that combine to create a sweet and sour fragrance. 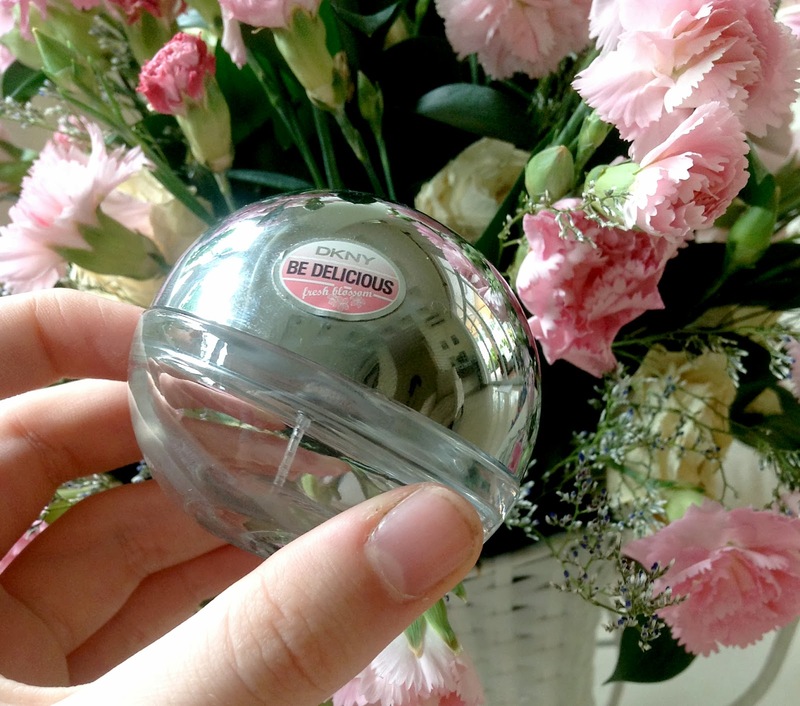 This is the DKNY "Be Delicious"Fresh Blossoms". Just imagine, walking down through a freshly bloomed spring garden, and the lovely, delicate scent of newly opened flowers surrounding you. This is what you experience when you spritz this over yourself. I know I may have over-romanticised it but thats how I feel when I use this. You can't see too well in the picture, but this bottle is a lot more loved than the original Be Delicious fragrance. Check this one out here. I used this one for quite a while, and I'm surprised at how long it's lasted me. This is Britney Spears Believe in the mini size. I bought this in a pack of four that included Curious, Fantasy and Midnight Fantasy. Alongside Midnight Fantasy, this was my favourite. Reason being is due to its lovely, fresh and airy scent. I can't pinpoint a description for this fragrance, so I'm going to leave it to Fragrantica. This is a scent I use on rare occasions due to my sentimental issues and wanting to preserve this perfume for far too long of a time period... I have issues. Time for a drum roll...My favourite perfume ladies and gentleman. Marc Jacobs "Oh Lola!" in the Sunsheer edition. I luuuuuuuuurve this perfume. It's incredible and perfection. 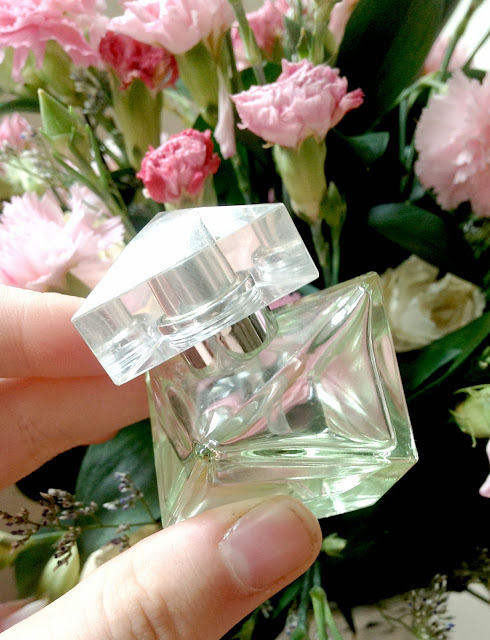 Everything about it is just amazing, from the bottle, to the scent, to the staying power and finally the value of it. Because who doesn't want to tell everyone you're wearing Marc Jacobs? (hmmm Emily...maybe a humble and modest person?). This scent is a perfect Summer/Spring scent, but with that being said there is nothing stopping you from wearing it in the Autumn/Winter months, because it's certainly not stopping me. It's a beautiful fresh scent with elements of watery fruits. Whenever I smell this I can't help but think of an island getaway. With such an incredible scent, you're going to hope it lasts. Considering this is my most-reached-for fragrance for school wear, is an indicator for it's staying power. My school days are around 6 hours long, and it only begins to slowly fade around lunch time which is two hours before the school day's end. I highly highly highly recommend purchasing this perfume and I believe it is worth every cent. Check it out here. Now finally for my last candidate. This one in particular is not a favourite, but I'm using it as an example. If you're not a fan of perfumes, or you aren't willing to spend the money, opt for a body mist...particularly those from the Victoria Secret line. They last for a while, come in many different scents, are inexpensive and easy to bring to school. That's it for today everyone! I again apologize for the lack of activity on my blog. Please understand that my school term is now nearing the end and therefore the workload is increasing at a rate I did not think was possible, along with study for exams. But I love to blog and it's a great procrastiantion activity and calms me down. 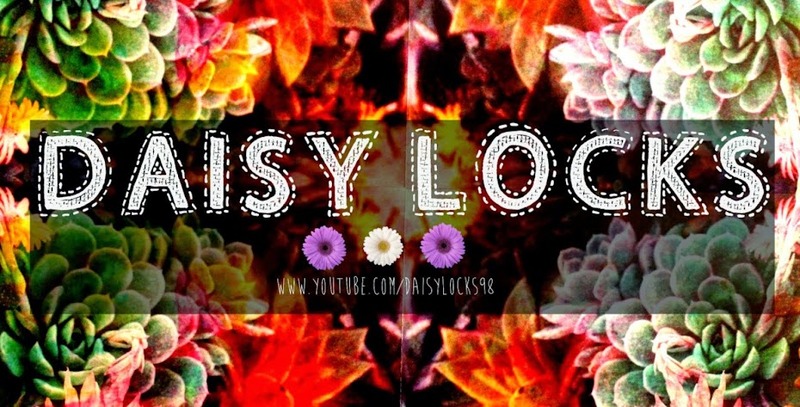 While I may not be posting, I am always reading, so feel free to link your blog along with your comment on this post :) Please also comment you're suggestions for future blog posts, I love to read what you want to be seeing here on Daisy Locks. I hope you all had a lovely day, and I'll see you in my next post. I have the green apple and absolutely love it!